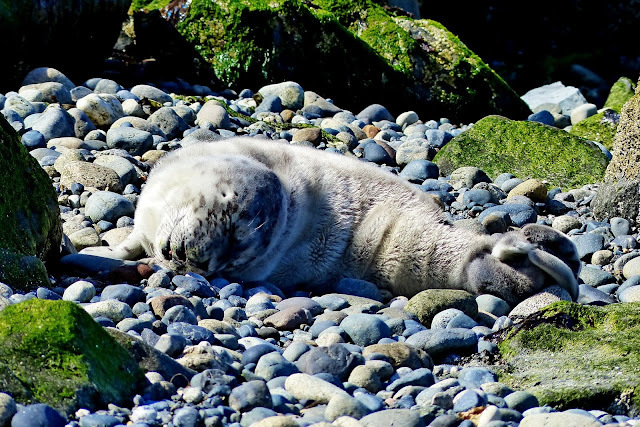 Harbor Seal pupping season has begun in Puget Sound. Seal Sitters volunteers (NOAA authorized stranding network organization) monitored a premature pup for three days on Alki Beach West Seattle beginning June 11th. The pup was a premature birth and still had the lanugo coat (usually shed in the womb before birth). While there was an adult seal in the area there were no observed feedings of the pup for 3 days. Premature pups have a mortality rate of 90% in the wild even if there is a mother with them. Often mothers abandon the premature pups. It was determined that the pup had not been fed since first observed and was weak and dehydrated. Under NOAA protocols the pup was removed from the beach by authorized Seal Sitters personnel for health evaluation. The examination determined that the pup had not been fed by the mother and was in very poor condition. For these reasons (and that survival even with medical care was extremely doubtful) the pup was euthanized by a WDFW marine biologist. While this is a sad start for the pupping season the Puget Sound seal population is healthy. On a side note a group of Transient Orca whales was seen in the area on Friday the 12th. These Orcas feed on marine mammals including harbor seals, porpoises, sea lions, elephant seals and whales. A larger than average number of these mammal eating whales have been seen in Puget Sound since last fall. The whales impact on the harbor seal population over that period is not known. Seal Sitters volunteers spent long hours monitoring this first pup of the season and will likely be spending many more hours doing the same monitoring as the pupping season ramps up. Anyone seeing a marine mammal on a West Seattle beach can contact Seal Sitters at 206 905 SEAL. They will respond quickly and monitor the animal as long as it is on the beach, keeping it secure from disturbance of people and dogs. Pups need rest out of the water for 50% of the time in order to conserve energy and heat. Forcing a pup into the water and shortening its rest period can greatly reduce the pups chances of survival. Disturbing a marine mammal by coming too close is illegal under the Marine Mammal Protection Act and can incur a fine and possible jail sentence. Please remember to share the shore. Thank you.